This extremely dangerous chemical geoengineering program implemented by the U.S. Military* must be shut down asap for many obvious reasons. The most obvious is that such deliberate pollution of our skies has produced an unrecognized and ever-worsening pandemic known as Chemtrail syndrome. This public health disaster could only happen because the U.S. Federal Government quite unbelievably permits it to. and possess the power to close down geoengineering operations this Friday, January 20, 2017. Only with the full support of the Executive Branch can such a harmful program be carried out on a regular basis. Therefore, We the People will know that when this highly destructive chemtrail spraying stops, you, Mr. President, are really in charge of the American Republic. 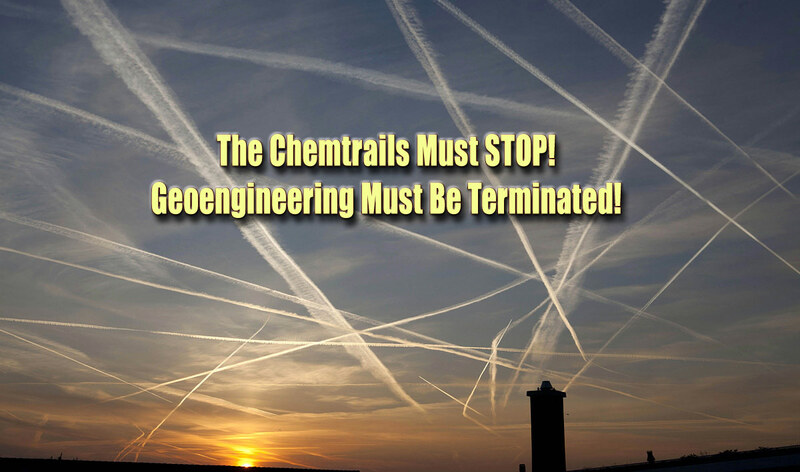 Why have the NWO Globalists been chemical geoengineering the skies over America for decades with absolute impunity? Now that’s a question that every conscious American wants an answer to. There are many purposes behind the chemtrail aerosols, as you probably know. However, the most significant objective (to artificially create Global Warming) is that the incessant chemical geoengineering, in tandem with the conveyance of HAARP frequencies through the chemclouds, have pushed the planet into a serious global climate change scenario. This little factoid is lost on many. It really is critical for the Trump Administration to fully understand the true geodynamic and atmospheric consequences of geoengineering. For the entire Global Warming scam hinges upon the high volumes of alumina (derived from coal fly ash), which becomes hydrated aluminum oxide when emitted as chemtrail aerosols. Just one last point about manmade climate change. Yes, climate change was, is, and will be manmade as long as the skies of the world are sprayed with aerosols containing aluminum oxide. The fact is that chemically mobile aluminum is extremely hygroscopic. This particular property has caused a dramatic increase in the amount of water vapor that is generated worldwide as the new deluge/drought weather patterns now attest to. Water vapor is already the most abundant greenhouse gas which few understand. While CO2 is also a greenhouse gas, it is the manmade generation of artificial water vapor that is pushing the planet to the edge of the envelope, both figuratively and literally. Hence, the more water vapor in the planetary atmosphere, the more global warming will take place. Hopefully you are getting the picture, Mr. President. Look closely wherever there is a LOT of chemtrail activity. There is also a LOT of chemcloud cover and much more precipitation in those places. Because chemtrail operations intensify rain events considerably, the global hydrological cycle has also been significantly affected. The bottom line here is that the radical uptick in the amount of water vapor worldwide has substantially contributed to the Greenhouse Effect. The following essay clearly explains this whole process. We hope that your administration takes a close look at it, as well as some of the other scientific research papers that are posted at this website. We conclude this letter by asking why the US government has been dumping massive amounts of coal fly ash into our skies. This is the very same coal fly ash that is removed as per EPA rules and regulations from coal-fired power plants. How does that happen … except by very purposeful design of the geoengineers? As citizens, we know that, until this environmentally barbaric practice is stopped once and for all, we and our children and our grandchildren are not safe. And, that our air and water, land and food will be poisoned by the steady onslaught of geoengineering chemicals. Please Mr. President, make this your first priority as you enter the White House. The whole world is in desperate need of a permanent ban on chemtrail operations. Thank you for your attention to this highly consequential matter. May God bless you and your presidency, and keep US all safe. P.S. FYI, they also spray chemtrails in Washington, D.C. as seen in this photo.